Synchronised swimming is a beautiful sport to watch, but do not be fooled by the elegance and grace with which it is performed as it is a tough and demanding activity that requires strength, strong lungs and a lot of hard work. Synchronised swimming involves solo, duo or team swimmers performing elegant choreographed routines in the water and in synchronisation with the music. 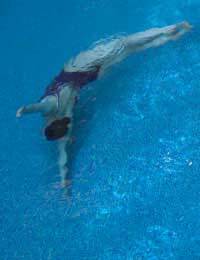 It was originally known as water ballet but it is actually a hybrid of three sports - swimming, gymnastics and dance. Synchronised swimming is potentially dangerous because of the great demands it puts on the body, but only for the inexperienced; the seeming ease with which it is performed is conversely a result of years of rigorous and disciplined preparation. For safe performance, swimmers are required to be strong, flexible and also display grace, artistry and perfect timing. As synchronised swimming invariably involves a significant time underwater, breath control is also hugely important. Tests at the last Olympic Games showed that synchronised swimmers have the second largest aerobic capacity after long distance runners. The standard equipment and costume practises of synchronised swimming adhere to both safety and artistic concerns. The standard attire for competitors includes a nose clip, to keep water from entering the nose, a hair net and gelatine to keep the hair in place, waterproof make-up, as well as a custom swimsuit and headpiece, both of which are usually richly decorated. Although standard for swimming events, goggles are not worn because they are believed to be detrimental to the artistic elegance of the routine. As part of a recognised club, synchronised swimming is such a well regimented activity that it is a relatively safe sport to participate in. Also, by being water based, the concerns about the tough physical activity involved are alleviated somewhat, because the water support helps protect against muscle, joint and bone injury. Although beginners cannot be expected to arrive at their first synchronised swimming class with lung power, physical prowess and artistic poise ready to go, they will be expected to demonstrate good swimming skills and physical fitness. Beginners should also be able to swim a width of any stroke, be happy to put their face in the water and confident in the deep end of the pool. It is an ever growing sport in the UK and beginners can be expected to work throw grades one to six in order to qualify for competitions. Even the more experienced swimmers can be affected by dangers involved with synchronised swimming. Shallow water blackout is a loss of consciousness caused by a lack of oxygen to the brain and can occur whilst the swimmer holds their breath and performs an underwater figure. In addition to blackouts, the milder affects include confusion and disorientation and the more extreme instances can result in death. The main cause of this condition amongst synchronised swimmers is the practise of using hyperventilation, or over-breathing, which some believe increases the time they are able to spend underwater. Hyperventilation is for this reason discouraged amongst swimmers.